DuraRite is a synthetic, heat resistant paper created for use in extreme conditions. It is actually waterproof and can even be used under water Ideal for sample labeling. Adhere to plastic, glass, or metal. Laser printable only. 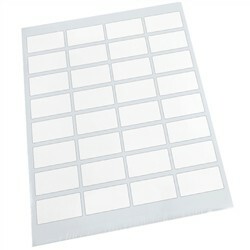 2" x 1 1/8" (32 labels per sheet) - 100, 8 1/2" x 11" sheets per pack. Not for ink-jet printers.